Is an IRA right for you? Take our Standard Bank One-Minute IRA Test and find out, then call one of our local offices today. You might be able to save on your present taxes with an Individual Retirement Account by deducting your qualified contributions from your taxable income. Many Americans can deduct all or part of their IRA contributions from current income taxes. The deductible amount depends on your income, marital status and whether you’re an active participant in an employer sponsored plan as defined by the Internal Revenue Service (IRS). With an Individual Retirement Account, you may also be able defer taxes until you retire when you will probably be in a lower tax bracket. You may want to consult your tax adviser to review the tax deductible status of an IRA. Regardless of the amount you’ll be able to save now on taxes, an IRA is a smart way for you to save for a secure retirement. Changing Employers? Don’t forget to rollover your IRA! If you’re changing employers, an IRA rollover makes sense. If you are retiring or changing jobs and anticipate withdrawing money from your employer’s retirement plan, you can avoid withdrawal penalties by rolling over your assets into an IRA or another qualified plan. You can ask your employer to arrange for a “direct rollover” of your money into a new IRA account with us, or you can do it yourself with an IRA-to-IRA rollover. You must complete the rollover within 60 days from the date you receive the assets from your old IRA in order to qualify and not pay the mandatory 20 percent (%) withholding and possibly other penalties as well. For more information about IRA rollovers or opening a new IRA just contact us! IRAs can be used to fund your retirement or to supplement your Social Security or company retirement plan. Because tax laws and eligibility requirements vary, we suggest you consult with your tax advisor to determine which IRA is best for you. The money you put in a Traditional IRA grows tax-deferred until you withdraw it in retirement. Because you don’t have to pay tax on the earnings that accrue each year, you can accumulate more money faster in an IRA than in an ordinary taxable account — even if the IRA and non-IRA investments earn the same rate of return. Penalty-free withdrawals are permitted before age 59-1/2 for a first-time home purchase (up to a $10,000 withdrawal), higher education expenses or in the event of disability or death. Unlike a Traditional IRA, Roth IRA contributions are made with after-tax money (not tax-deductible). However, withdrawal of earnings and distributions upon retirement are tax-free. So if you remain in the same tax bracket (or higher) at retirement, Roth IRAs allow you to accumulate more money than tax-deductible IRAs do. A SEP plan is an employer-contribution retirement plan for self-employed persons or small businesses. Employers establish a SEP plan by opening individual accounts called SEP-IRAs for each eligible employee. For 2011, your employer may contribute up to $49,000 or 25% of your compensation to your SEP-IRA. Yearly contributions range from 0-25% of earned income. Employer may receive deduction benefit. The Coverdell Education Savings Account (CESA) is a great way to help save for a child’s education expenses. It allows after-tax contributions up to the annual limit to be made for the child until he or she reaches the age of 18. The earnings in the account are completely tax free if the money is used to pay qualified education expenses such as tuition, equipment, fees — even room and board, anytime before the child reaches the age of 30. Putting money into a Coverdell Education Savings Account is easy and you don’t have to be the child’s parent to contribute. Friends and family members can make contributions to a Coverdell Education Savings Account as long as the maximum contribution per child is not exceeded. Contributions can be made to the CESA at any time throughout the year until the child’s 18th birthday. You can reach a retirement program specialist by calling (412) 856-0352 during regular business hours. *The above Investments are available in either a Statement Savings Account (Short-term investments) or Certificate of Deposit from 12 to 120 months. 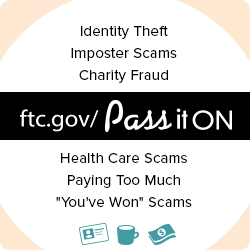 Be alert and pass it on! Standard Bank's Customer Care Center is open during regular business hours. Our local representatives are awaiting your call! Need an office phone number? Visit our Locations page.